June 9, 1884 –The Committee on Harbors and Bridges introduces an ordinance at the City Council meeting, requiring that bridges remain closed for at least 20 minutes after being opened with the time that they are open restricted to ten minutes. The problem of balancing the needs of over a half-million people with river commerce that had 11,203 vessels entering the port in the preceding year is becoming more and more clear. 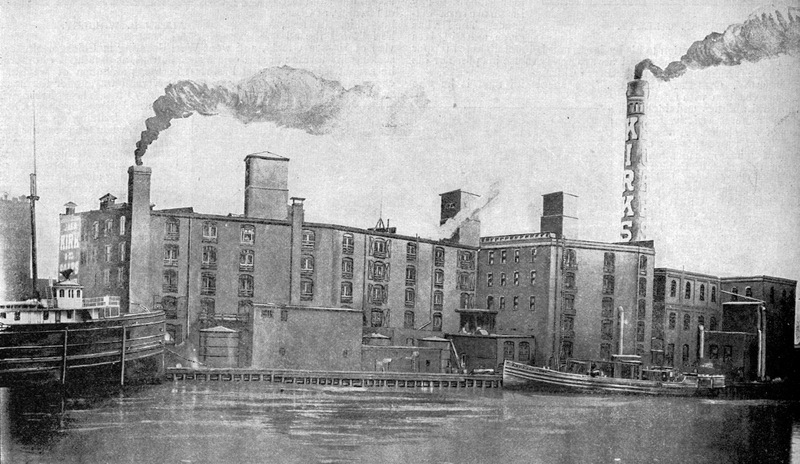 One alderman expresses the opinion that “citizens were entitled to as much consideration as the river interests … Business in the city should not give way for business on the river” [Chicago Daily Tribune, June 10, 1884]Another alderman warns against “Shutting off the shipping facilities by guarding the river too closely and subjecting the vessels to too many regulations.” A third says that the problem could be greatly improved if “the bridgetenders were more attentive to their duties.” Still another alderman observes that such an ordinance “would be a great detriment to the lake interests and drive the business to Milwaukee.” The council approves the report of the committee and places the ordinance on file. The subject would come up over and over again, but it would be close to a hundred and ten years before any meaningful restrictions were placed on the opening of bridges on the river. 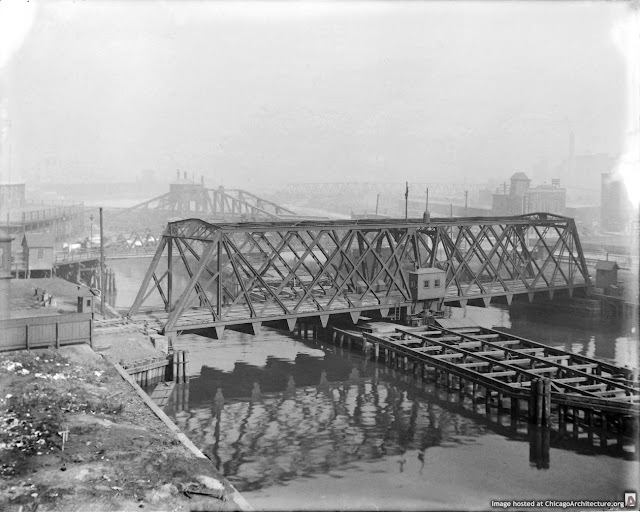 The above photo shows the swing bridge at Kenzie Street, the predecessor to today's perpetually raised bascule bridge. June 9, 1884 – The Chicago Harbor Master issues orders to stop a gang of men attempting to fill in a portion of the Chicago River at the Kirk Brothers Soap Factory, a river front operation that sprawled from approximately where today’s Wrigley Building stands to the east side of the lot where 401 North Michigan Avenue and the new Apple Store stand. The Chicago Daily Tribune reports, “Work has been going on for several weeks, and in plain sight of the city officials engaged in building the bridge at Rush street.” [Chicago Daily Tribune, June 10, 1884] When Harbor Master McCarthy investigates the situation, he finds a row of pilings extending 250 feet along the river and a dozen feet beyond the property line of the factory. The management of the company says the work is for a coffer-dam to protect the foundation of an addition to the factory, but they admit they have no permit. They also reply that the “coffer-dam” will not be removed when the work is complete. They are ordered to stop the construction and a police officer is posted at the site to make sure the order is obeyed. At the time of the incident James S. Kirk and Co. is one of the world’s largest soap factories with a workforce of 250; by the time the century ends it will employ 600 workers and produce about 100 million pounds of soap each year. The business ended in 1929. 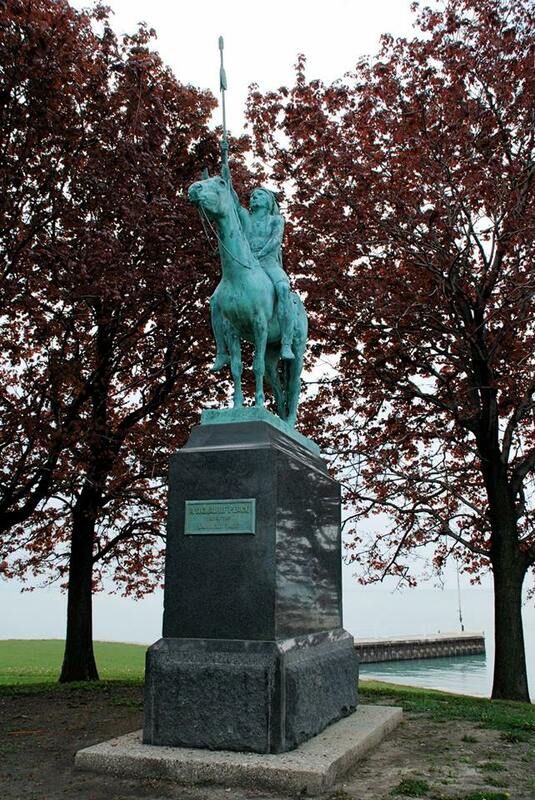 June 9, 1894 – The bronze statue “A Signal of Peace” is unveiled in Lincoln Park before 2,000 people. The statue is a gift from Judge Lambert Tree, a prominent judge of the Cook County Circuit Court who also served as the United States ambassador to Belgium and Russia. During the ceremony Lincoln Park Board President Crawford reads a letter from Tree in which the judge states, “I fear the time is not distant when our descendants will only know through the chisel and brush of the artist these simple, untutored children of nature who were, little more than a century ago, the only human occupants and proprietors of the vast northwestern empire of which Chicago is now the proud metropolis. Pilfered by the advance guards of the whites, oppressed by government agents, deprived of their land by the government itself, with only scant compensation; shot down by soldiery in wars fomented for the purpose of plundering and destroying their race, and finally drowned by the ever westward tide of population, it is evident there is no future for them, except as they may exist as a memory in the sculptor’s bronze or stone and the painter’s canvas.” [Chicago Daily Tribune, June 10, 1894] President Crawford then accepts the gift and the sculptor, C. E. Dallin, contributes brief remarks before he pulls a rope that reveals his work, which rests atop a pedestal northwest of the great equestrian statue of General Grant. For more on Judge Lambert Tree and his gifts to Chicago you may refer to two pieces in Connecting the Windy City, here and here.